OakBend Medical Center’s annual “Stepping Out Against Stroke 3k” is growing and going strong. This year over 400 people registered to walk the 3K and support the stroke program at OakBend. The Stroke Walk, held at George Park in Richmond, included breakfast snacks, health screenings for blood pressure and a DJ to entertain the crowd while they visited with the stroke walk sponsors. Many of the sponsors included games for children and adults along with educational materials about their businesses. The crowd began the walk with a series of stretches lead by Reagan Packard and Blake Burlingame from OakBend’s physical therapy department. For the third year, there were specific stations along the walk geared toward children. At each of the four stations, the children were asked to perform certain tasks such as (F) make a funny face; (A) how many arm hula-hoops can you do; (C) Can you say a tongue twister; (E) how many jumping jacks can you do in 30 seconds? Omega Home Health Services, Inc.
State Representative John Zerwas, M.D. For the 8th consecutive year, OakBend Medical Center’s Jackson Street campus has been honored with the Gold Plus Performance Award for its “Get With The Guidelines®” program, which promotes consistent adherence to the latest scientific treatment guidelines for stroke victims. Additionally, this is the first Silver Plus Award for the William’s Way Campus. According to the American Stroke Association, stroke is the fifth largest cause of death, and the leading cause of adult disability in the United States. A stroke affects the arteries leading to and within the brain. When a stroke occurs, the blood vessels that carry oxygen and nutrients to the brain either become blocked by a clot or by ruptures. When that happens, part of the brain cannot get the blood and oxygen it needs so it and brain cells die. By participating in the “Get With the Guidelines®” program, OakBend Medical Center is reviewed for twelve consecutive months and must have maintained a performance level of following key measures in treatment guidelines for at least 85% of the time. 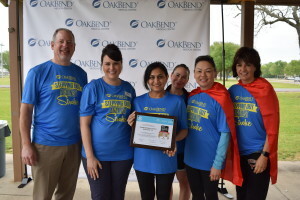 This year’s award was given at OakBend’s 2017 Stepping Out Against Stroke Walk with Allison Capetillo from the American Heart Association making the presentation.